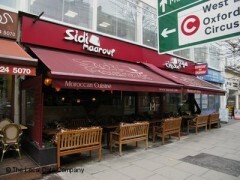 About: Sidi Maarouf serves authentic Lebanese cuisine in a relaxed environment. Fantastic ,Authentic Morrocan cuisine. Beautiful decor freindly and attentive service. The whole experience was fab, a good evening had by all.Well worth the money.